What is the best tire changer on the market in 2019? That’s exactly what we will look into today. If you run an auto garage a reliable tire changer that will keep on working year on year, with minimum maintenance is a must. But with a range of machines available, how do you know which to opt for? Your budget, whether you need a balancer and the amount you intend to use the changer will all be a factor. In this top 5 review round up we have selected only quality tire changers, covering a range of price point to suit different needs. For our results at a glance, just head to the table below. For full, in depth reviews of each of our choices, keep on reading. We selected the following tire changers based on price, build quality, speed and ease of operation to bring you what we believe to be the best tire machines on the market in 2019. The Triumph NTC-950 is our top pick across all categories because it perfectly hits the point of top quality functionality at the right price. The machine is a combo kit which consists of both a wheel balancer and a wheel changer. Once the car tires have been changed, you can easily proceed to balance the wheels ready for the vehicle to hit the road. The combo kit combines both the functions so that you can quickly change the tire and balance it. You clearly save on money over the long term because the machine is capable of performing both functions. 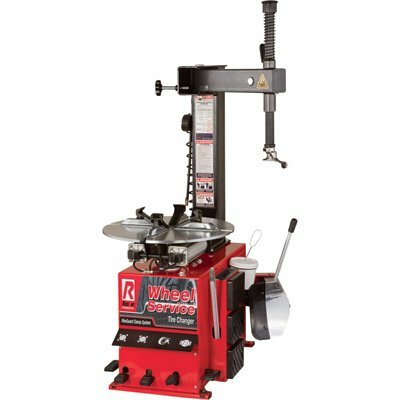 If you have a small auto shop where you need to save on space, then buying the wheel changer can be a great way to save on space too. The Triumph has good size capacity, and can comfortably manage up to 26″ rims, with a maximum tire diameter of 43″. Different processes have been automated which even reduce the amount of labor required in your tire changing shop. The machine features a jet blast inflation system which will make it very easy to inflate the tires upon changing them. The system has also been designed to make the process of changing car tires fast and simple. The controls are strategically located to allow for smooth operation of the unit. There is a powerful bead breaker system which simplifies the process of changing car tires. The metal and plastic demount head hold the tires firmly during the changing process. The design of the wheel balancer ensures greater accuracy. The unit features a foot pedal which is used to hold the wheel in position as the correct balance is calibrated. Price is high compared to others in our top 5, however you are getting a changer and balancer in one machine. Overall the Triumph NTC-950, along with the NTB-550 makes for a top quality changer and balancer combo. Yes, you will be paying more upfront but if you intend provide tire changing services at your auto shop, this is by far the most cost effective and efficient way of doing it. Our number one pick for good reason. The Mayflower is another efficient wheel changing kit which combines both wheels changing and balancing functions. It can change wheels up to a maximum diameter of 35 inches. If you intend to start a tire changing shop, the wheel changer can help you serve different cars. Different features have been incorporated to make your work very easy. With only a one year warranty, you have a little peace of mind starting out. That being said, different parts of the wheel changer are tested to ensure excellent durability. The machine includes the following rim clamping capability: outside 10″-18″ / Rim clamping inside 12″-21″. It also has a bead break force of up to 5600 pounds. Essentially, this is a professional level unit which comes with all the necessary power you need to realize fast and reliable wheel changing function. Tire pumping power is delivered via a pneumatic piston with an operating pressure of 120-145 PSI. Furthermore, with the high accuracy in the wheel balancing unit, you can be sure of achieving the best results when running the unit in your wheels changing shop. With the high-pressure build up, you can efficiently service many cars in a day. A 110V power source powers the unit. Another great tire changer and balancing combination kit, with reliably fast function and accurate balancing. While not up to the build quality of our number one pick Triumph, we still recommended the Mayflower based on price point alone. Well worth checking out. The Nationwide is a tire changer which comes with several features making it a great addition to your tire shop. With a swing arm, you can achieve different operations when changing the car tire. You have full control due to the manual operation in the mount and demount process. Other features which make the unit stand out to include its four pneumatic clamps which offer the best grip when trying to change tires. Side mounted bead breaker allows you to tackle any tire changing task. Even first-time users will find the unit highly useful in changing car tires. The inflation jets have been incorporated in the clamping jaws making them quick and easy to operate. The unit also comes with an adequate pressure regulator. You have full control of the pressure in the tires after you finishing the changing process. Other features which make the unit worth your money include the water separator and the lubricators. Apart from the combo serving as a wheel changer, it has an integrated wheel balancer. The wheel balancer NW-953 is self-lubricating as well as self-diagnosing. You can apply it to balance light allow rims among other wheels. The wheel balancer comes with features such as multiple operator programs, centering cones, pegs for different accessories and the weight storage unit. In short, you have everything you need to realize fast and reliable wheel changing and balancing services. The balancer on this machine has some great features, which does raise the combo kit above the competition in many ways. That’s not to say that the changer isn’t worth considering either. Overall a quality package and a worthy addition to our top 5 tire changer review round up. The Ranger Products tire changer is designed to service most OEM and specialty tires. You can use the wheel changer to work on the wheel of up to 21 inches. The designers took time to come up with wheel protection features so that you can always protect the wheel as you change it. Some of the protective features aimed to protect your wheels include a great nylon bead breaker cover, tool head guards and the wheel clamp guard. Wheel protection kit has been incorporated to assure you of excellent wheel protection when performing tire change. With the durable nylon bead breaker cover, there is no fear of exposing your wheel to damage. There is also a wheel clamp guard. Combined with the tool head guard and tool protection cover, metal to metal contact, which can lead to costly wheel damage, is easily avoided. However, the fact there is no wheel balancer included with this kit does need to be considered. Base Dimensions (in. ): 38 x 32. The Ranger Products is a high quality tire changer with some great safety features. The wheel protection kit is an excellent addition for instance. If tire changing is all you need, this is the unit to buy. However, where balancing is required too, you are better placed buying one of the combo kits in our top 5. This unit comes with an auxiliary arm and an air bead blaster function. With up to 12 months warranty, it is a durable unit you can have in your car tire changing shop. Professional assist arm makes the machine very easy to operate. A 1.5 HP motor available is strong enough to deliver the best experience when changing tires. The tire changer allows for quick inflation of the tires. You can rely on it to work on several car tires in a day. It also comes with a large air reserve tank that will not require filling very often. The manufacturers offer up to one year warranty so that you can enjoy using it with peace of mind for that period of time. The rim clamping specifications are good: clamping outside 10″-20″ / clamping inside 12″-24″. This gives you greater control over the type of tires you can work with, which is what you need to run a successful tire changing enterprise. Similar to the Nationwide tire changing machine, this does not come with a balancer however. Overall this is another good option for those looking for tire changing capabilities only. Fast, functional and with the capacity to work with a wide range of rim sizes, this unit does work well. We prefer the nationwide tire machine based on the wheel protective features it provides however. Choosing the best tire changer for your shop is no easy task. While the above reviews should help narrow down your options, you may still want to conduct some research further to see what is available. If this is the case, the following issues should be considered before you buy your new tire machine and or balancer. Overall quality – how durable are the machine’s components? A tire changer in a busy shop will see lots of action. To ensure the machine you buy is up to the task you need to be confident that the build quality is top notch. Robust steel and aluminium components should last longer. The side shovel and mechanism are the most used components, so need to be extra strong. The size and build quality here will be a good indication of the machines durability. If your machine is used in a professional shop setting, you will want it to be able to cater for every wheel and tire that comes through the door. The best machines offer wide wheel clamping versatility so that all wheel types can be worked with. A wide range between minimum and maximum rim diameter is also important on any wheel balancer you might buy. What is the weight and bulk of the tire machine / balancer? In line with build quality is the machines weight. Any good specification list will provide this. A heavy machine will generally mean a stronger machine as the components will have been made from heavier, more durable materials. Does the Tire Machine have a Press Arm Option? Certain tires will require press points to change them. For this your machine will need easy compatibility with an additional press arms. Ensure that press arms are available for the model you buy. Maybe even purchase one at the same time as the machine. Your tire changer of choice should have high quality air conditioning components. These are used constantly and you do not want the added stress of failing parts or high maintenance. Time is money and an out of action machine will cost you in the long run, no matter the initial saving on purchase price. After market specialty wheels are very expensive. You will not want to be billed due to damage caused while tires where being changed. Your chosen machine should have sufficient wheel protection built into every contact point with the rim or tire. What does the machine pack under the hood? For this we are talking about power. Today’s high performance tires require more torque to service than what was needed only a handful of years ago. The tire changer you buy will need to have sufficient power in order to provide that torque. What length Warranty is being offered? Your machine will suffer from a lot of abuse during its working day. A long warranty will help provide the reassurance that not only is the manufacturer confident its machine is up to the task, you have peace of mind should things go wrong too.